I have been performing a little emergency surgery on this old cookery book. 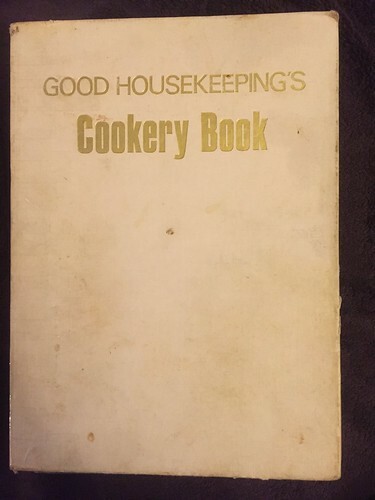 It is well worn and falling apart with a selection of old recipes tucked safely between the pages. It is my go to book on how to make classic sauces and meals but also contains some specials such as a section called ‘Recipes from round the World which has recipes for Baked Eel, Bird’s Nest Salad and Beetroot Soup. This book belonged to my Mum and it is annotated throughout with her thoughts. 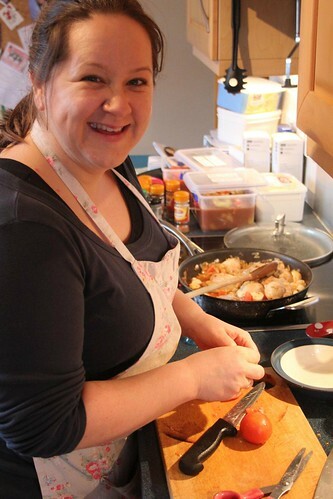 It makes me feel close to her, and I love the thought that she is able to continue influencing my cooking. I miss her so much. Today we went for lunch at Auntie Josie’s house and it was delicious!! A fabulous roast pork dinner with all the trimmings followed by lemon meringue pie. Yum. It was just nice to go out somewhere for a lovely Sunday lunch because we so miss being able to go to Mum’s on a Sunday. 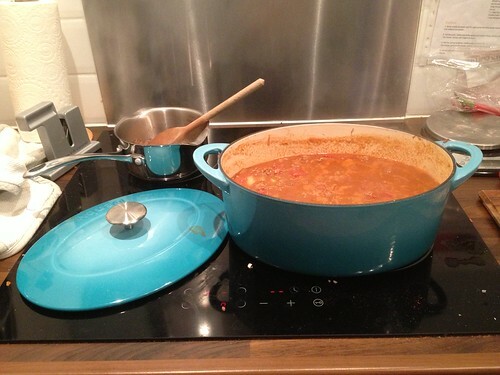 The Mister gave me a brilliant present for Christmas, it was this lovely Denby cast iron casserole dish. I really wanted something that I could put both on my induction hob and in the oven. I am delighted with it even if it does weigh a tonne. It is such a lovely colour though! Today I finished work for Christmas. Usually I would be really excited at this point and thoroughly looking forward to the festivities. This year I am trying but it doesn’t have the same sheen to it. Tonight however my sister and I had to go and do some shopping for Christmas. we had a massive list and decided to go and buy all the non-perishable stuff. We thought we had done really well until we got it back to Dad’s house and we seem to have spent an awful lot of money on not very much! When shopping together we are terribly inefficient though – we go around and around in circles! One thing I am hugely grateful for is that I have my sister to rely on. That is something that I never expected to say but it is absolutely true! 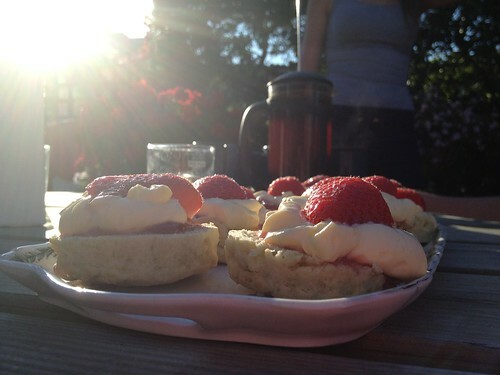 Thanks to my lovely Auntie Josie we had scones with jam, cream and strawberries for our dessert today. Delicious! The Mister has even persuaded her to make profiteroles for a picnic and outdoor theatre trip on Friday evening. He is very persuasive when it comes to puddings and Auntie Josie is most amenable. Hurray! Well, today you get a bonus of two photographs! Today it is my Auntie Jen and Auntie Josie’s birthday. 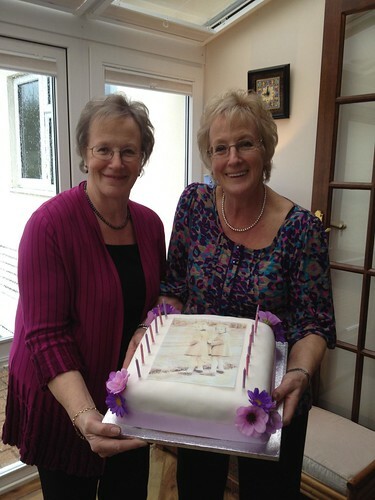 Obviously they are twins and they reached the grand age of 70 (shhhhhhhh, don’t tell anyone!) 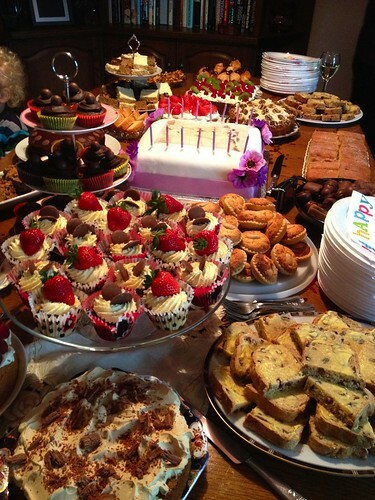 So they had an afternoon tea and cake party and lots of people dropped in. My Mum had made them a fruit cake which had a picture of the twins when they were little on the top. 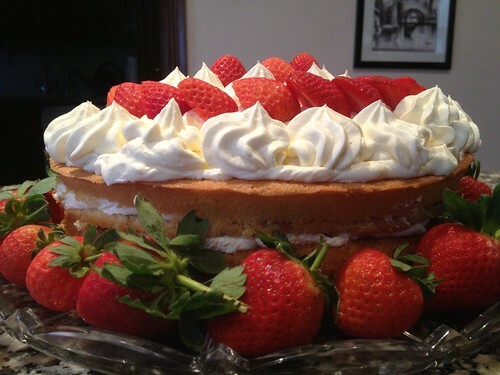 It was a delicious cake but weighed an absolute tonne! In this picture it looks slightly as though Auntie Josie has a curvature of the spine. She hasn’t, but she was holding the majority of the weight of the cake! I have to admit that the diet seriously went out of the window. This second photograph should show how many different cakes there were. I kind of cruised my way down the table trying a little bit of this, and a little bit of that. Oh dear. Diet disaster, but it was delicious! My staple diet for the evening…. 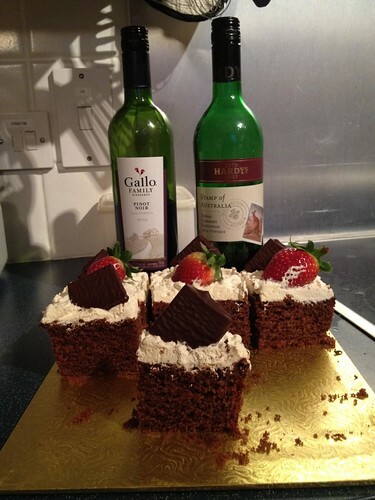 Chocolate cake and wine. What more does one require? 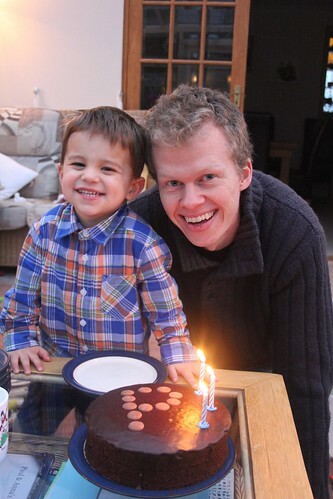 Today is The Mister’s birthday and we have had a lovely relaxed day. We spent the morning lying in bed watching the Australian Open final on TV and then my sister, brother-in-law and the children descended to have roast dinner with us. They were all on good form, and in particular Barnabas was very keen to help his Uncle blow out his candles on his birthday cake! I have to admit that I made a fabulously good chocolate birthday cake… however when I tried to work out the Slimming Wold syn value I got scared! I have spent nearly all day shopping for food and then cooking. I am trying to eat healthily and I am doing Slimming World. I managed to cook 6 meals and put them in the freezer. So, not the most exciting day but at least we will have some nice food to eat over the next week or two.